Zoom around on this map to explore the 100 fastest growing counties in the US from 2013 to 2014. The data are from the US Census Bureau’s 2014 Population Estimates that were released on March 26, 2015. 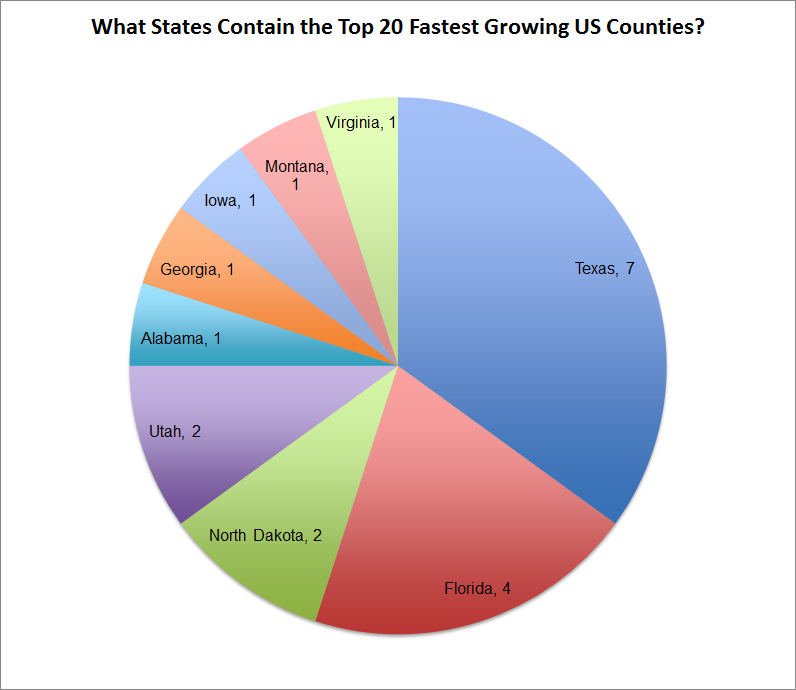 The top 20 fastest growing US counties from 2013 to 2014 are listed in the Chart below. Source: US Census Bureau, 2014 Population Estimates, Released March 26, 2015. Download the top 100 county list as an Excel file. Texas contains 7 of the top 20 fastest growing counties while Florida has 4 counties. As a Central Texan who lives near to Hays, Comal & Williamson Counties, I’m not surprised to see these 3 counties in the top 20 fastest growing list. With solid job opportunities and a reasonable cost of living, continued population growth in Texas is likely. As for Florida, I’d be interested to pull age data for the new residents. Is this Florida population growth due to Baby Boomer retirees, or are families and young couples moving there in search of job opportunities? Surprising: North Dakota and Where’s California? With 2 North Dakota counties at the top of the fastest 100 growing counties list, it appears that the North Dakota oil boom continued to attract workers through 2014. And surprisingly, no California counties appear in the top 20 list this year.